Not getting the perfect output from your current sound system? Looking to upgrade your sound system to enjoy superior quality music? Well, you’ll need to think upon quite a few factors. After all, deciding on a particular set of speakers for your car isn’t exactly an easy choice to make, what with the tons of different options out there? However, there isn’t a reason to worry either, as we’ve decided to make the job easy for you. We will list some of the most important factors you need to keep in mind while searching for your perfect speakers that will allow you to enjoy a whole new level of music. So, all you’d need to do is make your decision based on these factors as well as your subjective needs. Once you're done with this article you can look at some car speaker reviews to find your next car speaker. This is probably one of the most important questions you need to ask yourself before you go shopping for your desired type of speakers. Both the category further consists of quite a few different options, so it’s quite important to choose one of these two types of speakers. This will allow you to choose from only those speakers that would suit your needs well. Firstly, before describing what both these type of speakers are all about, it’s worth understanding that there isn’t a specific answer as to which one of these is the better option. Some may like to go with the first one, while some others may find the second option to be the ideal choice for them. It actually all depends on your subjective needs, and this is the reason you should always try matching your needs with the features they come with, and consider going with what seems to be fulfilling most of your needs. Now, coming to component speakers, they’re known for the quality of sound they produce. A lot goes into helping them deliver such superior quality sound though, so you may have to take care of quite a few things if you decide to go with them. Also, they’re considerably expensive than their full-range counterparts, and hence not the recommended option for people with a low budget. The component systems usually come with tweeters, external crossovers, as well as separate woofers. These systems boost of a great design, helping all these parts work extremely smoothly with each other. This is what results in a more realistic, live-like, and great quality sound. In fact, the sound quality may turn out to be far better than some of the common full-range speakers, though the latter too come with their own set of advantages. Also, these speakers are usually made out of a better quality material than full-range speakers, so that’s too something worth noting. All these advantages help them produce a better quality sound. The full-range speakers, on the other hand, may not offer such a high sound quality. However, they too have quite a few things to boost about. First and foremost, they are considerably cheaper than their other counterparts. This alone might attract a lot of buyers, as sometimes buying high quality car speakers may turn out to be quite expensive. Furthermore, despite being cheap, they don’t really seem to be compromising on the quality front. Yes, they may not usually be made out of as high quality materials as the component systems, but they too usually seem to be durable enough. The second most important full-range speakers seem to be offering is the ease of installation. This can be quite an important factor if you’re a do-it-yourselfer. Installing component systems all on your own may turn out to be a very challenging task, and there will always be a probability of doing something wrong that may either result in a few extra expenses or a lot of wastage of your time. Hence, the full-range speakers definitely seem to be having an edge over their other expensive counterparts on this front. What more, replacing them is just as easy. All one needs to do is buy new ones and replace them, as the installation process doesn’t involve anything complicated. However, it’s again worth noting that things can be tremendously different while dealing with component speakers on this front. Also, just because full-range speakers are cheap and don’t seem to be offering as good a sound quality as component speakers, doesn’t mean that they aren’t good enough. In fact, if you’re someone new to car speakers, you may find them to be perfectly good. So, even they do seem to be offering quite a good sound quality, though maybe just not as clear and detailed as component speakers. In short, if you’re someone who doesn’t want to settle for anything less than perfect when it comes to the sound quality, getting component speakers may be the way to go for you. On the other hand, if you’re someone who appreciates the ease of installation, budget friendly price, and a reasonably good sound quality, there shouldn’t be a problem going with full-range speakers. To put simply, sensitivity refers to balancing the power provided to the speakers with the sound output. So for example, if your car features a low-powered stereo, which is usually around 15 watts RMS per channel or even lower, your best bet may be to get speakers that come with a higher sensitivity, over 90 dB to be precise. What this does is ensures that the low power input is utilized to the fullest, and in turn, produce high quality sound. It’s probably worth taking into account that most of the factory-installed car stereos come with a lower power capacity, thus making the high sensitivity speakers the ideal choice for them. However, you’ll have to think differently if you got a high-powered stereo system in your car, which would usually be if you got an aftermarket one, or got for the system an external amplifier. Such systems would usually boost of a power capacity of more than 16 watts RMS. This ensures a superior level of power supply, making the high sensitivity speakers somewhat undesirable for such systems. After all, high sensitivity speakers don’t seem to be doing that well with high power stereos, and hence it’s recommended to avoid them if the power applied to the speakers is more than 16 watts RMS. For such high-powered systems, speakers with lower sensitivity ratings may turn out to be the best. They’ll offer superior sound quality, as high power and low sensitivity would ensure a perfect balance, just like low power and high sensitivity does. Proper balance of power and sensitivity always helps yield the best possible sound quality. This is another significant factor to keep in mind while considering different speakers for your car. In simple words, power-handling simply refers to the amount of power the speakers can handle. This obviously means that if the stereo system in your car is a low-powered one, you need not bother getting speakers with a very high power-handling capacity. This may just mean more expenses and under-utilization of your speakers, besides maybe the possibility of encountering some technical errors at some point of their use. Again, as mentioned before, if you’ve never did anything to the stereo system that came with your car when you bought it, it would be a low-powered one. So you can get your speakers accordingly, by considering only the speakers with low power-handling capacity. On the other hand, if your stereo boosts of powerful external amplifiers, speakers with low power-handling capacity may be a big no. You’d instead need something that can continuously handle the amount of power your stereo is offering them. The reason we mentioned ‘continuously’ here is because there may be a lot of speakers that boost of coming with a high ‘peak’ power handling, and not a very high ‘maximum’ RMS power handling. What this means is that speakers with a high peak power handling ability may be able to handle the high power offered by your car’s stereo for a short period of time, but not continuously. On the other hand, speakers with a high maximum RMS power handling will probably be able to handle high amount of power input continuously, and in an uninterrupted way. This would ensure that you don’t encounter any problem with the system’s functioning, as well as always get a high level of sound quality. Finally, if you got a low-powered stereo system, speakers with a power-handling capacity of 2-50 watts RMS would probably do well than those with a 10-80 watts RMS one. Though this is a rather basic factor, it’s tremendously important to keep it in mind. Ignoring the size factor may result in problems related to installation, and may sometimes make it almost impossible to install the new speakers, especially if the size varies significantly. However, in most cases, you may be able to find speakers of the same size. So, all you’d need to do is drop the new speakers in the existing speaker receptacles, by removing the old ones first. If you’ve really made up your mind on changing the speakers, you might as well remove them and measure the size. However, if you don’t wish to do that, you can simply consider visiting a store that sells speakers and share some details about your car, such as the make, model, and year of the vehicle. In most cases, this will be enough for them to come up with the size and configuration of the speakers you need, or your existing ones. We have reviewed the following sizes: 5.25 inch car speakers, 6x8 inch car speakers, 6x9 inch car speakers, 5x7 inch car speakers and 6.5 inch car speakers. Sometimes, a poor build quality is what forces car owners to go for new speakers. Usually, most of the OEM speakers come with a rather poor build quality, resulting in their degradation over a period of time. This is the reason you may be able to get a better and superior sound quality by simply upgrading your speakers while keeping everything else the same. Good quality speakers that are built using high quality materials alone can result in improving the sound quality. Rubber surrounds usually seem to be quite durable, and are long lasting. Foam and cloth surrounds aren’t exactly as durable as rubber surrounds, but are still considered to be considerably better than their foam and paper counterparts. You can also find speakers built out of harder materials like ceramic or metal. They may last a long time too, though it’s believed that quite a lot is also dependant on your use and handling. Lightweight woofer materials such as polypropylene offer a great brass response, besides being quite durable. Speaker materials include woofer, tweeter, and surround materials. We’ve already talked about surround materials, so let’s take a look at the other two now. Woofer materials: In order to produce high quality low notes effect, woofer materials are required to be of lightweight, but stiff materials. Manufacturers usually seem to be going with polypropylene for woofers as well, not leaving much to be desired. Such woofers may also manage to withstand heat, cold, as well as moisture to a considerable extent. Tweeter materials: Now, this is something where it gets a bit subjective. Usually, tweeter built out of softer materials such as textile blends, poly, or silk seem to be producing a great sound. However, if you’re someone who is fond of bright and snappy highs, going with tweeters built out of harder materials such as metal, ceramic, or graphite may be the way to go. Pivoting tweeters – If you’re looking to replace your full-range speakers, getting pivoting tweeters may make quite a lot of difference. This is especially true if the speakers are installed at the lower end of your car’s door. Such pivoting tweeters help aim the sound towards the listener, resulting in a more realistic and high quality sound. External crossovers – To put simply, external crossovers help avoid the woofers and tweeters to reproduce the frequencies they are not required to reproduce. This results in cleaner, more detailed sound. Component systems usually seem to be coming with external crossovers. Detachable tweeters – They simply allow you to use your speakers both as component speakers as well as full-range speakers. This can be important for those who intend to use their speakers in a different vehicle. 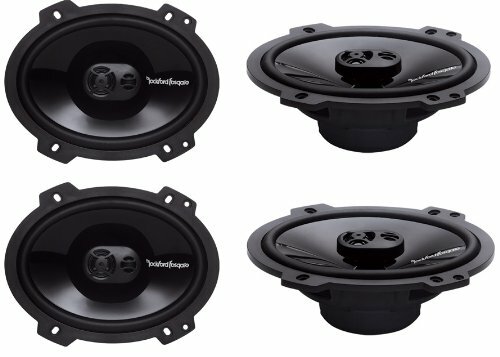 Everything mentioned above can turn out to be quite helpful in finding the right speakers for your car, despite there being tons of different speakers, which may otherwise cause a lot of confusion and make one go for the wrong ones. However, do not forget to keep your subjective needs in mind besides everything that has been given above.